Unemployment insurance offers funds, for a limited eligibility period, to people who lost their jobs and have not fyet been able to find and start a new job. 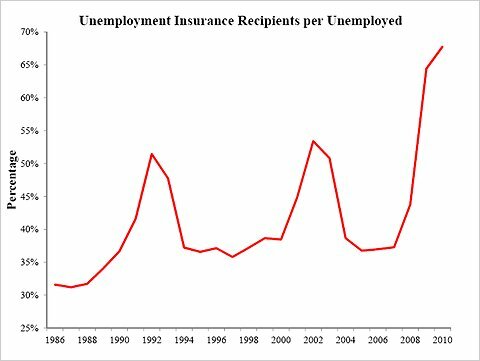 In 2008, “emergency unemployment” legislation, plus automatic triggers in the unemployment insurance rules, extended the eligibility period to up to 99 weeks from 26 weeks. Several times since then, and as recently as last week, new legislation has prevented the eligibility period from returning to 26 weeks. The length of the eligibility period has received much attention; it affects how much the program spends and how much unemployed people receive. For example, if the weekly benefit were $275, and an unemployed person were unemployed for a year, then the average weekly benefit he would receive under the 26-week rule would be about $138 ($275 for half the year, and zero for the other half). However, the eligibility period is not the only part of the unemployment insurance rules that have changed since the recession began. The American Reinvestment and Recovery Act (the “stimulus law”) made a number of additional changes. It increased the weekly benefit by $25 a week (and guaranteed that the $25 increase would not cause anyone to lose Medicaid coverage); federally funded 100 percent of extended benefits; exempted the first $2,400 of unemployment insurance received in 2009 from federal income tax; and paid 65 percent of an unemployed person’s health insurance premiums. Three years ago I blogged about the effect of labor supply on real wages. I have continued to update this work, eg here, and here. The fact is that the real wage time series fits my recession narrative very well. The propensity of unemployed people to receive unemployment benefits reached historical highs after the 2008-9 recession and may indicate that benefit rules have more impact on the economy than ever before. 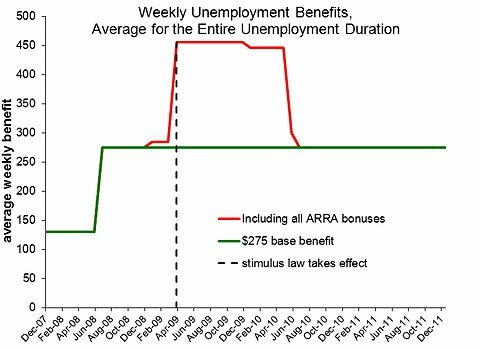 The changing aggregate impact of unemployment insurance may be worth considering as Congress debates benefit extensions. Unemployment insurance offers funds, for a limited eligibility period (now up to 99 weeks), to “covered” people who lost their jobs and have yet been unable to find and start a new job. Some economists suggest that unemployment insurance prolongs unemployment because recipients have to give up their benefits as soon as they find and start a new job, or return to working at a previous job. Some economists also say they believe that unemployment insurance stimulates spending because unemployed people are thought to spend most, if not all, of the money they have on hand. But neither of these effects can operate unless people take part in the program. Historically, many of the jobless have not collected unemployment benefits because of ineligibility, lack of awareness or unwillingness to do so. The chart below graphs the recipiency rate — the percentage of people unemployed who are collecting unemployment benefits that week — to 1986. It was calculated from weekly data, then averaged over 52 weeks to remove some of the large seasonal patterns. The percentage is always well under 100, fluctuating from 31 to 68 percent. The peak recipiency rates seem to follow recessions; three national recessions have occurred since 1986, in 1990-91, 2001 and 2008-9. Previous studies covering the period 1960-94 found a similar pattern (although perhaps no recipiency rate peak was found after the 1981-82 recession), with a maximum recipiency rate for all 35 years of about 50 percent. Some unemployed people cannot collect benefits because they quit their jobs, rather than being laid off. But quits are less common during recessions, one reason the recipiency rate is greatest during recessions. Another reason that recessions can have high recipiency rates is that, by law, benefit eligibility periods are longer during recessions. Laws often increase the eligibility periods by a greater percentage than the average duration of unemployment increases, with the result that a larger percentage of the unemployed are eligible for benefits. Among other things, the 2009 American Reinvestment and Reinvestment Act expanded eligibility for unemployment insurance by encouraging states to adopt an “alternative base period” benefit calculation rule that allowed a number of people with weak employment histories to qualify for benefits. Long-term comparisons of recipiency rates are tricky because the data sources change and because of secular changes in the composition of unemployed, but it appears that recipiency rates were higher during 2009 than they have been in 50 years, and perhaps ever. With such a large percentage of unemployed people receiving benefits, the potential employment and spending effects of those benefits may be greater than ever. The recession and lack of recovery have often been characterized as a lack of hiring, rather than an extraordinary number of employer-employee “separations” (a separation is a layoff or what the Bureau of Labor Statistics calls a “quit”). But the aggregate data on hiring, quits and layoffs can be misleading. 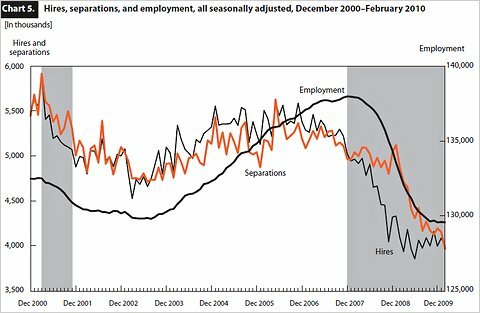 The chart below from the Bureau of Labor Statistics shows total hires, separations and total employment from December 2000 to December 2009. The shaded area to the right indicates the start of the most recent recession. Both separations and hires fell about 20 percent (the hires dropped sooner). However, this characterization is quite different for young people than for the rest of the work force. Even during business cycle expansions, young people have high rates of job turnover. The number of young people hired during a typical month is disproportionately high, as is the number of young people quitting or getting laid off (I use the term “layoff” to refer to both layoffs and discharges). For this reason, young people could dominate the job turnover statistics, even while they do not dominate the employment statistics. A paper by Michael Elsby, Bart Hobijn and Aysegul Sahin, using a method developed by my University of Chicago colleague Robert Shimer, estimated job separations for different age groups according to the number of people flowing into unemployment. They found a very different pattern for people 16-24 than they did for people 25-54. Estimated job separations among employees ages 25-54 were 33 percent greater in 2009 than they were in 2007. I tried to update their estimates through 2010 and found that job separations still remained greater than they were in 2007. In contrast, the low employment rates for young people since 2007 are almost entirely explained by low hiring rates. The Bureau of Labor Statistics also reports that the composition of job separations has changed a lot since 2007. Before the recession began, quits were by far the most common type of separation; now the number of quits about equals the number of layoffs. Perhaps the decline in quits is a signal of what’s ailing the economy, although I view it largely as a consequence of the unemployment insurance system. A person who quits his or her job is not eligible for unemployment insurance. As a result, calling a job separation a “quit” rather than a “layoff” results in the loss of unemployment benefits. I estimate that, before the recession began, a person beginning unemployment would receive about 12 weeks of unemployment benefits, on average, if he or she were eligible for benefits. By 2010, that average was up to about 34 weeks. At $300 a week, that means that the government subsidy for calling a separation a “layoff” rather than a resignation was up to about $10,000 from $3,600. There is also the employer payroll tax consequence of layoffs to consider, but overall employers and employees now often have a lot to gain by calling their separation a layoff rather than a quit. These are a couple of reasons the aggregate data on hiring, quits and layoffs can be misleading. Even so, the very different patterns for people 16-24 and 25-54 may suggest that the recession and lack of recovery have more than one cause. Advances in genetics may change aspects of environmental policy in the future. Protecting endangered species is a legitimate goal for public policy. But we cannot expect that public policy will prevent all species extinctions, because scientists estimate that hundreds of species, if not thousands, become extinct every year, many without our knowledge. A rational approach to protecting endangered species would balance costs and benefits. Landowners bear many of the costs, because they can lose title to land that is home to an endangered species or be restricted in how they can use their land. Businesses bear some costs, too, as they are sometimes required to alter their activities to protect an endangered species. One objection to the cloning approach is that cloning is itself too expensive. That’s true with today’s technology, but future genetic technologies will invariably be more efficient (cheaper for what they produce). Another objection is that a cloned species would not be genetically diverse enough to survive, because it would be cloned from just a few DNA samples. But that objection also springs from today’s technology. Scientists may learn to save a genetically diverse DNA sample or even to produce genetic diversity themselves. Yet another objection is whether we would have room in the future to house a cloned species. But it would seem to me more space intensive to protect each endangered species’ habitat for hundreds of consecutive years than it would to store some DNA and find space when the time comes for cloning.